Steel may be too heavy for the masonry to support. Also, while it can’t burn itself, it is very vulnerable to fire. Steal gets soft like boiled spaghetti when heated and bends. It’s what happened to WTC; it could withstand the plane crash but not the heat of the fire. I’d prefer wood, but maybe regulate the humidity so it doesn’t dry out too much over the centuries. Even iron is not totally immune against fires. Iron willingly oxidizes (slowly), cast iron just has a too small surface, but in very hot fires it burns as well. The Cologne cathedral (finished in 19th century) received a steel roof and it is not too heavy since it’s thinner than wood beams. Important to hinder the stack effect / chimney effect is to have partition walls (e.g. concrete and fireproof doors). To reduce weight, even partition curtains are effective. I agree that steel does not perform well under high heat, however if there is no other major fuel source for a fire in the structure then I would think that steel is a pretty safe bet. As you say though, weight may also be an issue. The flying buttresses and other masonry structural elements probably have limited capacity so weight may be an issue. However, the previous roof cladding was composed of lead tiles so if that is replaced with a lighter material then the structure beneath has a bit more liberty. Perhaps glulam beams with some sort of fire retardent treatment would be a good option. I’m sure they will have teams of engineers mulling all of these options over for months, given the amount of money behind this project. During the fire our president has declared that he wants to rebuild Notre Dame de Paris in 5 years, and the cathedral will be more beautiful than before. I think if everyone came together and agreed on everything then it is possible. However, there will be many stakeholders and everyone will want to have their voice heard and their input considered. Look how long it took to rebuild the World Trade Center in New York. The issue was not so much the construction as trying to get everyone on the same page. Realistically it will probably take three to four years just to sort out what should, could and will be done, from that point it will be another 1-3 years for actual construction. there is obviously no possible comparison with the WTC, which was totally destroyed, for a start. True, the magnitude of the damage/disaster is considerably less, so hopefully the time taken to determine what best course of action to take is proportional to the situation. Only time will tell. yeah we’ll see. I don’t think 5 years will be enough but they just want it to be rebuilt for the olympics. That’s what they want about any big project happening in Paris right now anyway, and i’m not sure it’s a good idea to be such in a hurry for a such ephemeral event. I just came across a great article in the Notre Dame roof. “it took 50 years to prepare the timber”, “1500 trees”, “they were immersed in a swamp for 25 years”, “allowed to dry for another 25 years”. Today’s Wall Street Journal and New York Times have summaries of the damage, some photos, and a diagram of the cathedral’s structure. One newscast said there aren’t enough large trees left in France to rebuild the roof structure as it was. This statement gave me a sense of just how massive this place is. 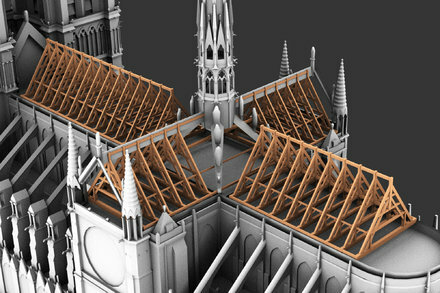 Apparently, Ubisoft is releasing for free Assassin’s Creed Unity that features a model of Notre Dame that took 5,000 hours to create. Ubisoft’s page including the link to Download for game. They only used timber trusses and lead sheets for the roof because it was the best they had hundreds of years ago. Now we have steel/aluminium/r.c, fancy-engineering, light-weight aluminium/titanium/synthetic roofing sheets etc. So a much quicker and cost effective roof solution should be available. It can look much the same externally and the main stone-vaults hide its underside anyway. Chelmsford Cathedral had its timber roof removed some years ago and replaced with a steel and concrete structure, no one notices it today. The ND spire was replaced about 180yrs ago - again the best they had was lead on wood, using some steel framing. 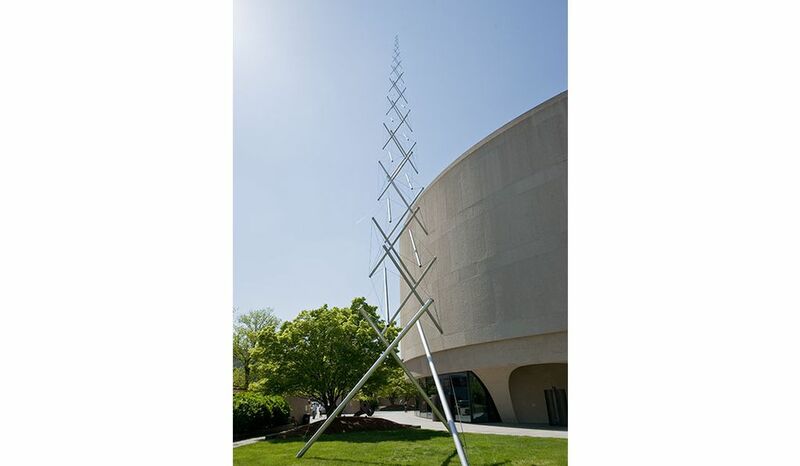 Its modern replacement lends itself to an innovative 21st century solution - like a tensegrity spike [not the 50s Skylon]. e.g. but x3 bigger ? They can then put a phoenix on the top rather than a cockerel ! …and a nice online interactive too. While steel doesn’t hold up in a fire, it doesn’t contribute to the fuel load of the fire. As I understand it, fire investigation is a science itself, and calculating the amount of material in a fire and what amount of fuel it contributes to the fire is a primary subject. As a roof structure, it’s not so much that the roof didn’t hold up during a fire as much as the roof was the fire itself. I always tend to say: ‘save the method, not the material’ when it comes to restauration. You can not replace a piece of framing which has been carved by hand, nurtured by the hands of a carpenter for a miil sawn piece of standard size without loosing some essential: the human touch. Currently there is virtually no timber roof to repair, or restore. If the Gothic builders had had modern materials they would have used them. I appreciate the skill involved in quality timber construction, but stacking a large bonfire above a stone box, means that one day it will catch fire - by accident, lightning etc. The old roof was the fire - as has been said - so why repeat the same mistake. Chelmsford Cathedral already replaced its ancient timbers with more modern non-flammable equivalents [which is unseen, as it would be at ND]. At a time when in the 21st century we are supposed to be nurturing the earth and its natural resources, I see little logic in felling many acres of hundreds of mature oak trees just to be used in this re-roofing - what’s more important a somewhat redundant but repairable church, or an irreplaceable mature oak forest? Maybe he wants to rebuild the burned up confidence in leadership, instead. Maybe you don’t see a difference if you replace the roof with other material. Maybe it is not what we build, but how much attention it gets while produced. For the non-UK members… this is a reference to St Michael’s, Coventry Cathedral, in Warwickshire [14th c.]. Only the spire and some stone walls remained. Its ruin was made stable and was left open to the sky. It had an altar of rubble and a cross made from two charred wooden beams. Some years later, after a competition in 1950, a new Cathedral was built adjoining it. but it’s now see as a symbol of reconciliation and rebirth - it’s been made ‘Grade 1 listed’. The adjacent ruins [with the spire kept] are still part of the church - they are now a garden of remembrance. It would a good SketchUp exercise to design modern, modular truss system which would include the roof supports AND the curved support for the vaulted ceiling below. I would imagine that a titanium alloy would be very good for the use being significantly stronger than aluminum which weighing less and able to handle all the heat you can throw at it. If you have a couple of billion, materials shouldn’t be the limiting factor. I agree that the original architects used what they found the best and most plentiful in the 1200s. Today, they would do it using the best of today. Could we get some basic measurements to be able to start designing?